Welcome to Shankton State Pen, inmate. This little slice of hell will be your home for the next 64 years. Now, you may get some bright ideas about escaping. Everyone does, but no one ever succeeds. CHALLENGE ACCEPTED! 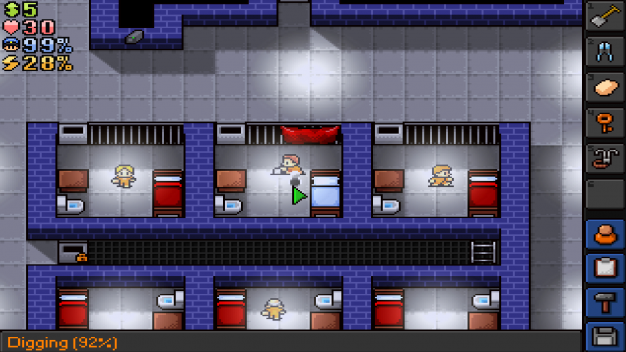 The Escapists by Mouldy Toof Studios is a hilarious, fun little game where you play as an inmate with big plans to break out of prison. Though this game may look simple, it requires excellent time management skills, puzzle solving capabilities and a little luck if the inmate wants to go anywhere anytime soon. 8:00 a.m. - Wake-up and roll call. 11:00 am. - Recreational time. 1:00 p.m. - Afternoon roll call. 2:00 p.m. - Work out. 3:00 p.m. to 5:00 p.m. - Recreational time. 7:00 p.m. - Evening roll call. 8:00 p.m. - Lights out. Sleep. As you can see, with only three hours a day of recreational time (free time), there’s not a lot of room to plan a breakout. So how do you do it? That’s the fun part. As an inmate, you have to slowly amass money and supplies to craft the tools needed to set your escape plan in motion. The only way to do that however is by working, stealing from inmates, beating up guards, and doing “favors” for the other convicts. “Favors” can be any number of things. From jumping another inmate to distracting the guards during breakfast or role call. See an example of a favor in the screenshot below. 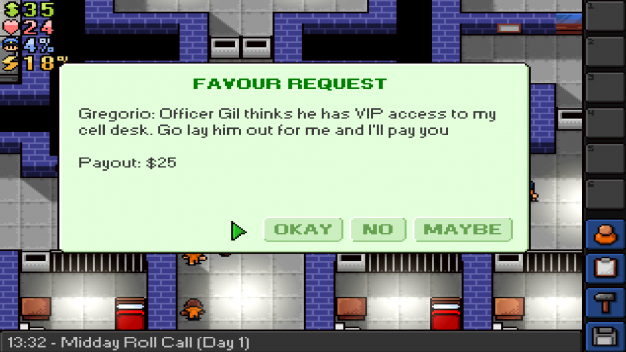 While some inmates offer favors, other inmates have things to sell. That’s where the money comes in. Inmates can sell any number of things. I bought a step ladder from one inmate in my game. The items you buy (or steal) can then be stored away for later use or crafted into something more useful. 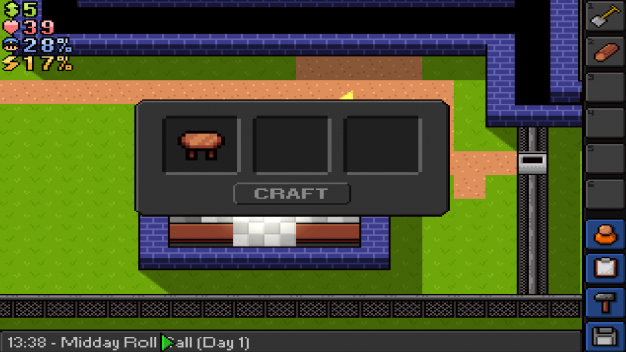 Be careful though– many items in The Escapists are considered illegal, as they should be. Illegal items can and will be confiscated if you break prison protocol. You can break prison protocol in many ways. Since the game is constantly in motion, you can get in trouble by not being where you’re supposed to be at any given time. You can tell you’re in trouble when guards start harassing you to get a move on. Eventually, the warnings will escalate into beatings. When that happens, guards will come detain you (knock you out) and you’ll wake up in the infirmary with your illegal items gone as well as some of your money. The only way to avoid this is by not getting caught (obviously) or simply avoiding the guards. If you DO get caught by the guards you can always fight if you think your stats are high enough. In The Escapists, you have four numbers and three stats to keep an eye on. Good management of these seven things will make your time in prison that much easier. Money: How much money you have is dictated by the green number in the top left corner of your screen. Money is earned by working and doing favors for other inmates. You can use it to buy items needed for your escape. Health: Your health is the red number located in the top left corner of your screen, just below money. Your health determines how long you can last in a fight before you get knocked and wake up in the infirmary. Guard Heat: This number is blue and located beneath health in the top left corner of your screen. The more heat you have the more the guards are looking for you and likely to detain you. Energy: Your energy is the yellow number found just below Guard Heat in the top left corner of your screen. Energy allows you do to things such as work out and read. If you run out of energy, you can’t train your inmate. Strength: Strength is a stat found on your inmate’s profile screen. The higher your strength stat is the more health and power you have in fights. Speed: Speed is another stat found on your inmate’s profile screen. Speed determines how fast you move, which is useful when trying to outrun guards in an attempt to lower your Guard Heat. Intelligence: The last stat on your inmates profile screen is intelligence. Intelligence determines your crafting capabilities. The higher your intelligence, the more advanced items you can create. By keeping a good eye on your stats and effectively managing your time and money, The Escapists can easily become a fun yet challenging game for anyone. I personally had a blast playing it. I have yet to break out of prison but just learning how to work the time system in my favor (I found a way to stay up all night), looting other inmate’s cells, getting strong enough to beat up on people and hiding stuff from guards was an awesome experience in its own right. Learning how to craft new items was exhilarating too. You find pieces of paper with crafting recipes randomly throughout the game so you never know what you’ll learn how to make next. Each new recipe puts you that much closer to breaking out. The guards aren't very nice. Especially during roll call. The game isn’t perfect however. I did get a disclaimer stating that the game isn’t complete yet and I agree a bunch of things could still be better. There is little to no tutorial for one. I played the game initially for three hours before I realized I could buy items from other inmates and check the stats on guards. I didn’t know what my stat intelligence was for, I wasn’t sure how to complete certain favors and there’s a stat on the NPCs called Opinion that I still don’t know the function of. It is also a tad buggy. You have an inmate journal that lists all the current favors you’re working on and crafting recipes. Well, the crafting recipes section doesn’t work. I’ll learn how to make a new item but nothing ever gets saved to my journal. I had to resort to writing down each recipe on an actual sheet of paper. Those were just minor annoyances however. I caught on to everything eventually and have been enjoying myself ever since. There also appears to be more prisons in the works, most likely with different layouts and schedules. 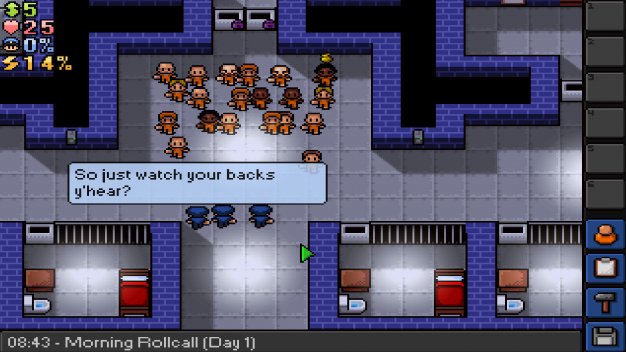 Now get ready to break out The Escapists on Steam, July 9, 2014.